"Ten little Indians—it's like the nursery rhyme: Ten little Indian boys went out to dine, one choked his little self, then there were nine..."
Born Agatha May Clarissa Miller in 1890, Agatha Christie would become the most popular mystery writer of all time, publishing over 66 novels (not including her series of romantic novels as Mary Westmacott), as well as numerous short stories and screenplays. Published five years after it was written, her first novel, The Mysterious Affair at Styles(1920), featured one of her most beloved characters, retired Belgian inspector Hercule Poirot. Murder At The Vicariage introduced Miss Marple to the world in 1930, another Christie favorite. Following two of her most popular titles, Murder On The Orient Express (1934) and Death On The Nile (1937), she would create another classic whodunnit in 1938 with Ten Little Niggers, based on a popular parlor tune, first Americanized as Ten Little Indians; later, it became the more politically correct And Then There Were None. French director Rene Clair (Le Million) would be the first of many to adapt the story to the screen in 1945, with veteran cinematographer Lucien Andriot (The Diary Of Chambermaid) behind the lens. Ten strangers are invited to spend the weekend at a mansion on a remote island. Upon their arrival, they find their hosts, a Mr. U.N. Owen and his wife, are delayed in London. After introductions, the guests gather for dinner, where the table centerpiece sparks discussion of an old nursery rhyme. When an ominous and accusatory recording is played later in the evening, new light is shed on the reasons for their summoning to the island. However the plot thickens when one of them dies of suspected poisoning before bedtime, and with the discovery of a second body the following morning, the mystery of who is behind these events begins to unravel, as the eight remaining question whether there is a murderer in their midst—and who may be next. One problem with screen versions of the murder mystery genre is that it is too easy for characters to have their intentions uncovered prematurely due to the directing of the actors and their expressions. Unlike some of the many later adaptations, this version does a good job of maintaining suspense up until the final scene when the truth is revealed. Rene Clair keeps us guessing what will happen next, while offering limited foreshadowing. Suspicion is cast on all parties as the characters grapple with their predicament, and the cast does a fine job relaying their fear and anxiety without exposing the answer to the enigma. The cinematography utilizes the location effectively, with constant reminders of their desolation adding to the atmosphere, and odd, deliberate camera angles heighten the tension. Like all Agatha Christie mysteries, the finale puts all the pieces together, and the ending here, while predictable to a point, is satisfying, if liberally adapted for the screen. While not exactly faithful to the novel, it is a good translation in tone. 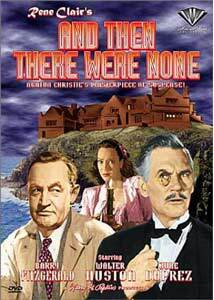 For an excellent, old fashioned whodunnit, you can't go wrong with the original And Then There Were None. Image Transfer Review: And Then There Were None is transferred from original film elements, but had me worried through the credit sequence, which contained excessive gate wobble and a number of distracting print defects. However, as the film progesses, things get a lot better, with only minor imperfections present for most of the rest of the film. There are some problems at splice points here and there, and some more major blemishes from time to time, but on the whole this is in relatively good condition. Grayscale is extremely well rendered with few contrast issues, and a fairly even tonal representation. Grain is also translated naturally, and is not over predominant. Detail is good, with no edge enhancement noticible. A bit of a grade reduction for the flaws, but pretty decent overall. Audio Transfer Review: Mono audio is well presented, apart from some expected distortions and limited frequency range due to its age. There are some minor defects in places, but in general is very acceptable, with clear dialogue and no excessive sibilance. Extras Review: When Agatha Christie's novel was first published in 1939, it was titled Ten Little Niggers, from an old parlor song, which at the time did not have the same social discomfort it has today, and the British release of the movie carried that name. The film was released in the United States as Ten Little Indians, the North American version of the same tune. Included here for historical reference is the original British title sequence, which is in much better shape than the one used in the main feature. Well acted, and skillfully directed, And Then There Were None maintains the feel of Agatha Christie's classic murder mystery novel, with wonderful cinematography adding to the tension. The transfer here is not flawless, but still holds up, and the inclusion of the original title sequence was a nice touch. For a classic whodunnit, this one fits the bill nicely.